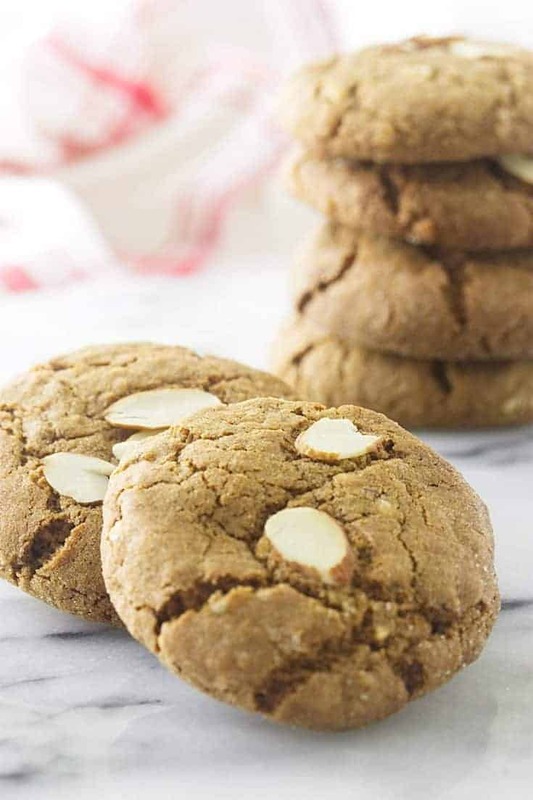 These triple ginger-almond cookies are the ultimate of ginger cookies. They are packed with flavor from ground ginger, fresh ginger and crystallized ginger with an added crunch from chopped almonds. Savor The Best participated in the 5th annual Great Food Bloggers Cookie Swap this year and these triple ginger-almond cookies were our contribution. The surprise ingredient in these cookies is a touch of freshly ground white pepper. 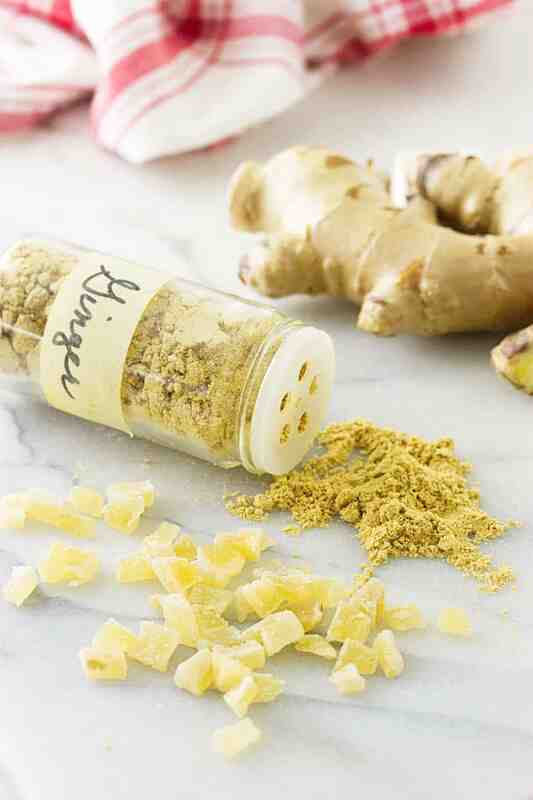 I know that sounds odd but, trust me here, it is pivotal and enhances the taste of the ground ginger, crystalized ginger, and the grated fresh ginger root. In the event that you don’t have white pepper then black pepper will work but you will see the little black spots. Nothing compares with the taste of these freshly baked cookies. They are the most indulgently decadent ginger cookies I have ever tasted. 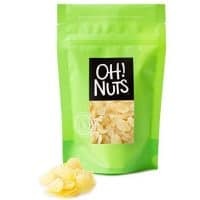 They are soft, chewy and loaded with an intense ginger flavor and a delightful crunch from the chopped almonds. This a wonderful combination. 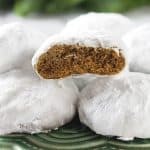 These are the ultimate ginger cookie! You just have to make these cookies; I’m sure you won’t find anything like them in the supermarket. As a matter of fact, I will make one important suggestion…..stir up a double batch! 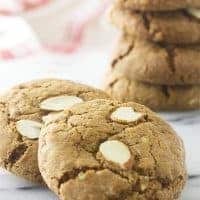 These triple ginger-almond cookies are soft, chewy and loaded with an intense ginger flavor with a delightful crunch from the chopped almonds. In a large bowl, add the flour, almonds, ground ginger, cinnamon, cloves, soda, salt and white pepper. Whisk to combine thoroughly. Using a mixer, add the butter, white and brown sugars to a large mixing bowl and blend on medium-high speed until light and fluffy. Add the egg and beat until combined then beat in the molasses, grated fresh ginger, and the diced crystallized ginger. Slowly add the flour mixture and blend just until combined. Transfer the dough to the refrigerator and chill for 1 hour. 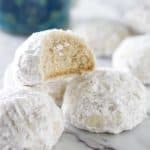 Add the cup of sugar to a shallow bowl or pie plate and using a medium-size cookie scoop, scoop the cookie dough out in mounds of equal size and roll into balls. Coat the balls in the sugar and place on the prepared baking sheet about 3 inches apart. With your finger, make a small indentation on the top of the ball and press in several sliced almonds. With the bottom of a 1/4 measuring cup, gently press down on each ball of dough to slightly flatten. Do not flatten too much as the cookies will spread and become thinner. 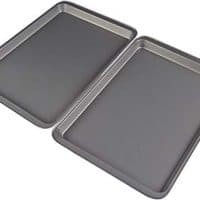 Transfer the baking sheet to the middle rack of the oven and bake for 13 minutes. Remove from the oven and allow to cool for 5 minutes on the baking sheet, then transfer to a cooling rack to cool completely. Crystalized ginger is usually available in the bulk foods section of supermarkets like Whole Foods and WynCo Foods. If unavailable in diced form, the slices can be chopped easily.If you like crisp ginger cookies leave them in the oven for 15-16 minutes. 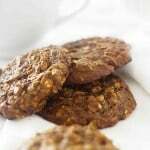 Have you made these Triple Ginger-Almond cookies? If you did, would love to hear from you and see a picture. Tag us on Instagram or drop us a message below. 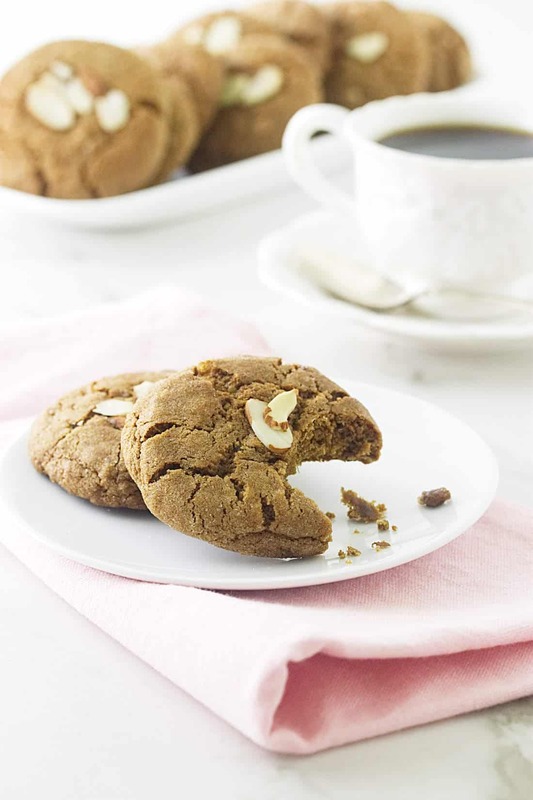 Yum, these ginger almond cookies look fantastic! 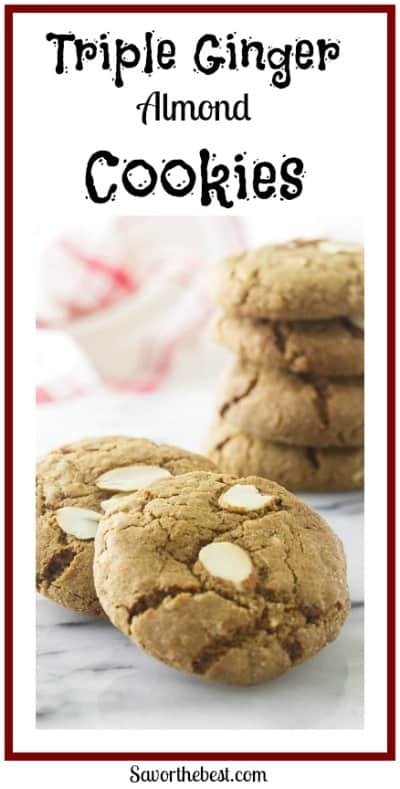 You SO had me at triple ginger — these cookies are a must try! Hey, Thanks for visiting our site, Sue-these are really yummy cookies. Definitely a keeper! Love the spicy, tang of ginger. And triple ginger? Sold! These look wonderful. And so perfect for the season — or really, any season. 🙂 Thanks.